To subscribe to Sen. Wellman’s E-Newsletter, click here. Today marks the first day of the 2019 legislative session, and I wanted to give you a quick update on what’s happening down here at the state Capitol. The past few weeks have been a whirlwind of preparations, and I’m excited to get to work putting people first. The Senate Democrats added three new seats to our majority in the 2018 election. Sens. Mona Das, Emily Randall and Claire Wilson have joined our ranks in the 47th, 26th and 30th districts respectively. Republicans held these districts last year. House Democrats have also bolstered their majority, flipping seven previously Republican seats. Once again, I am the chair of the Senate Early Learning & K-12 Education Committee. I will also serve on the Higher Education & Workforce Development and Labor & Commerce committees. I chose this combination of committees because they are inextricably linked as we’re actually rebuilding our education system from the inside out, preparing our youngsters for careers in a 21st Century economy. 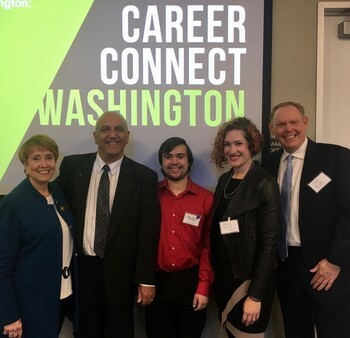 I’ve been participating in Career Connect Washington meetings for many months. Our aim is to prepare students to move forward through numerous pathways. These paths can include 2 or 4 year colleges, registered apprenticeships, internships, military service and certified credentials. To ensure prosperity for each Washingtonian, we must make sure that each component of this system is working together, that there is a clear pathway to success. The system must work for all types of students, including those who learn better through hands-on education (click here to learn moreabout the hands-on educational opportunities available through Career Connect Washington). We’re “operationalizing” this system and moving youngsters through High School and Beyond Plans with their understanding and buy-in and their family’s support. Educational equity demands every student, classroom and school have high speed broadband. So many children in our rural communities are falling behind because those communities don’t have this foundational infrastructure. Success in the modern economy depends on technological education. I’ll be leading the Governor’s initiative to re-create the Broadband Office. We need someone committed to waking up every day with a mission to provide high-speed access across Washington. And I have a bill to require every high school offer Computer Science as an elective. Plans for K-6 and middle schools are in development. (I also sit on the Energy, Environment & Technology committee). I’m excited to introduce my team, who will keep my Olympia office running smoothly this session. Noah Burgher is returning as my legislative assistant, Keshia Blandford is my session aid, and Kennedy Birley is interning in my office. They’re a great team, and I look forward to working with them. I am excited to see what Democrats can accomplish in Olympia during this legislative session. We are poised to make great gains for Washingtonians, and I hope you follow along. As always, don’t hesitate to reach out to me via email, phone or social media, including Facebook and Twitter. Thanks for the honor of serving you in Olympia. The final gavel fell on the 2018 legislative session last night and I couldn’t be more proud of what our new Democratic majority accomplished this year. We started 60 days ago with big goals and we were able to deliver legislation that will improve lives in communities across the state. I have a lot to share! The biggest investment we made this year was in education, and as chair of the Early Learning and K-12 Education Committee, I spent a bulk of the session focused on improving schools and education policy. Our final budget fully funds teacher salaries by the start of the 2018-19 school year, as ordered by the state Supreme Court. We were also able to make needed adjustments to the sweeping education legislation (HB 2242) passed in 2017. Our schools will see more funding for special education, and levy capacity will grow at a more accurate inflationary rate, which will help maintain local support for enhancements we value in our Eastside schools. I was also proud to sponsor the Breakfast after the Bell legislation in the Senate this year. The idea is pretty simple — hungry kids have a hard time paying attention and learning. This common-sense legislation will result in more kids starting the day with a nutritious meal, a dynamic that has been proven in the schools that already had this program. I will have another update soon highlighting all the other great investments made this year in the supplemental operating, capital and transportation budgets. I was proud to again sponsor the Keep Washington Working Act (SB 5689), which would safeguard our thriving economy, protect the state from the lack of federal immigration action, and recognize the important role of immigrants in Washington’s workplaces. I believe we have a responsibility to stand up for Washington businesses and protect our economy. From Puget Sound tech giants like Amazon and Microsoft to our agricultural producers across the state, our economy depends on the energy and talent of immigrants. While the legislation did not pass this session, I will not give up on all the workers who are the engine of our economy. I plan to introduce the bill again in 2019. One of the measures I worked on this year concerned perfluorinated chemicals, which are found in fast food wrappers, microwave popcorn bags, and butter wrappers, among other everyday items. These persistent chemicals get into our food and from there into our bodies, where they build up to increasing levels. The chemicals have been linked to health concerns ranging from cancer, to developmental toxicity, to the disruption of hormones. The House companion legislation to my bill passed the Legislature and will lead to our food being packaged in safer materials. Washington also became the first state in the nation to ban perfluorinated chemicals in firefighting foam. For years, firefighters have sprayed the foam around Washington’s military airstrips and fire-training facilities, including the facility in Issaquah. The state Department of Ecology will now study these chemicals so we can take a comprehensive approach to creating a toxic-free environment. 2018 Washington State Senate Democrats. When Democrats won control of the Senate last November, we identified several key priorities as part of a session-long focus on “putting people first” and completing the people’s work on time with a balanced budget. We passed landmark legislation with bipartisan support throughout the 2018 session, putting the needs of people first in a wide range of areas. We passed a statewide property tax cut to give households relief from the Republican Property Tax of 2017. In 2019, property taxes will be lowered by $0.31 per $1,000 of assessed value. We banned bump stocks, the device used in the Las Vegas massacre to give a semi-automatic rifle the rapid-fire capability of a machine gun. We required equal pay for equal work to close the wage gap between women and men who do the same work with the same experience. We passed The Reproductive Health Equity Act to make sure women have the option of choosing the healthcare choices that are best for them and their families. We also passed legislation to require health care providers to cover the cost of 3-D mammograms and to require doctors to inform and assist patients who have high breast density, to better detect early signs of breast cancer. We strengthened health care coverage for all Washingtonians, addressing health care needs such as disease screening and contraception access in the event the Trump administration continues to undermine the Affordable Care Act. We expanded high-speed broadband access to rural communities through actions to increase internet access throughout our state, regardless of where you live. We took action to create more family-wage jobs in rural areas by: directing the state to assess thousands of acres of trust lands that could be harvested without harming endangered species; requiring the state to explore ways to make common-sense land swaps to boost our timber industry; and creating a stronger market for wood products by updating the building code to include cross-laminated lumber. We increase funding in the capital and operating budgets to help stem the opioid crisis. Much of the funding is directed toward behavioral health and crisis care. We protected Washingtonians from unfair fees charged by financial institutions to freeze and unfreeze credit accounts when information is breached as in the notorious Equifax debacle. We expanded voter access to Democracy on several fronts. We passed The DISCLOSE Act to expose hidden money in elections; same-day voter registration, automatic voter registration, and voter pre-registration; and The Washington Voting Rights Act to provide representation to disenfranchised voters. We passed Net Neutrality to protect Washington households from receiving slowed or reduced internet service. We protected college students from fraudulent and predatory practices by lenders that saddle students with spiraling debt by passing The Student Loan Bill of Rights to protect. We reformed juvenile justice to reduce recidivism by increasing access to evidence-based rehabilitative services for certain youth who would otherwise be tried and sentenced as adults. We also gave prosecutors more discretion to divert less serious cases so youth can access the services and help they need to get back on track. We passed The Dream Act 2.0 to expand access to higher education for students who are DACA recipients. We fought to limit the disclosure of people’s religious affiliations to protect them from federal authorities who would use the information to arrest or apprehend law-abiding Washingtonians. We banned conversion therapy, the practice of applying physical and mental discomfort to try to force LGBTQ minors to conform to a gender identity other than which feels appropriate for who they are. We phased out Atlantic salmon net pen farms that threaten the health of our water and native finfish populations such as salmon. Yesterday was International Women’s Day and we marked the occasion with a video message. Please take a minute to watch the video on my new official Facebook page. I am proud to be a member of a caucus that prioritized legislation to make our households healthier and our communities stronger. As a result, our state provided a national example for what can be done when Democrats are united and put people first. Please continue to reach out to me with any questions. It’s a true privilege to serve the 41st District. As 2018 begins, I’m happy to report some exciting changes in the Legislature. After five years of Republican control, Democrats gained a one-seat majority after winning a special election last November in the 45th Legislative District. With Senate Democrats back in the majority, our caucus now has the power to set the agendas of committees and floor action, determining which bills will be heard and brought up for vote. This change in power gives us opportunities to pass important legislation that puts people first! I recently visited Enetai Elementary to learn more about ECEAP. The Legislature convenes today in Olympia and I will have the honor of chairing the Senate Early Learning & K-12 Education Committee. As a former educator, I am thrilled to have the chance to focus on improving outcomes for the more than one million children in our public schools. As you know, the Legislature passed a broad package of legislation in 2017 related to the McCleary school funding case. When this passed after lengthy special sessions, there was uncertainty as to exactly how these policy changes would play out in each school district. In our first public hearing in the education committee on Jan. 9 we’ll hear from school districts about ways we can improve and refine that legislation so that we move closer to our overarching goal – ensuring every student receives a world-class education. I recently sat down with the League of Education Voters to discuss the upcoming session. You can listen to the podcast here. In addition to my Senate committee assignments, Lieutenant Governor Cyrus Habib recently appointed me to his International Trade and Economic Development Commission. One of my first priorities early this session will be passing legislation to expand the successful “Breakfast After the Bell” program to more schools around the state. The program ensures more students — especially those with limited financial means — have access to a nutritionally balanced meal after the first bell of the school day. We know the traditional before-school breakfast program doesn’t always work for every student, and this bill will give our districts more options to put students in a position to learn. I’m also focused on expanding access to high-speed internet across the state, especially ensuring access in every classroom and public library. Several school districts still lack access to a reliable internet connection, and that must change. If we expect our kids to attain the skills they will need to compete in our current global economy, we must have digital parity across all 295 school districts. When the long 2017 session finally ended last summer, Senate Republicans left town and refused to bring up the bipartisan capital construction budget for a vote because of an unrelated dispute with the House over rural water wells. Their actions have delayed important projects throughout the state, including school construction and important environmental cleanup projects. They blocked hundreds of family-wage jobs and many state employees have been laid off. As we resume work to resolve this standoff, I have renewed hope that we can pass a capital budget early this session and get these crucial projects re-started. We toured the Yakima watershed, learning about the need for infrastucture projects critical to our economy across the state. • I joined Principal David Staight and other leaders to celebrate the grand opening Bellevue’s Bennett Elementary. It’s exciting to think of all the learning that will take place in that beautiful facility for years to come. Go Bulldogs! • I had a great visit to Enetai Elementary (photo above) to visit with students in ECEAP (Early Childhood Education and Assistance Program). I learned a lot about this innovative program for our littlest learners. There are many children still waiting to get into this program – we have more work to do! • I had the chance to travel east of the Cascades to learn about Yakima watershed’s integrated management strategy. This partnership is all about sustainability – water for today and water for tomorrow. • I travelled to Moses Lake to discuss rural jobs, tour local manufacturers and visit a data server farm. It’s always exciting to see great examples of economic development in rural Washington up close. I was also interviewed by the local paper about my ideas on how to improve infrastructure financing. Please don’t hesitate to reach out to my office this year. I always love to hear about the issues important to you. It’s a true honor to serve you in the Legislature. Wishing you and your family a happy, healthy and productive new year. The Legislature is through with the 2017 sessions (for now), and we’re in the interim. Much was accomplished but much was left unfinished in a very long and contentious political arena. I want to bring you up to speed on how I’m spending my time. After session I immediately sent word to all the 41st school districts to ask their operations people how the budget decisions relative to McCleary would work for them. They were busy trying to determine the immediate and longterm impacts and not ready to report. I’m continuing to monitor progress and ready to discuss possible tweaks that may be needed. As a legislator, I’m asked to understand and vote on many issues, often with limited personal knowledge. I’m using this period to dive deeper into areas that are critical to our district but also to the state in general. Here are some of my major appointments. I was appointed to the Washington State Arts Commission and attended a two-day meeting in Wenatchee. This small but important board oversees a program that brings art to public places throughout the state, and supports the Poet Laureate and art programs in public schools. The organization has developed a robust strategic plan that I found most impressive. In July, I spent four days in Richland learning about the generation of energy, the grid that distributes it in our state, and the issues surrounding moving to alternative energy sources. All states must reduce their carbon footprint; it’s an economic and political issue that’s top priority for all. The event, the Legislative Energy Horizon Institute, included a meeting with Pacific Northwest National Labs’ personnel. I’ll be spending another four days with the Institute in D.C. soon. Over 800 participants attended a four-day meeting in Portland that provided a heavy dose of information from resilience and cyber-security, higher education economic development, infrastructure and other working groups. The event provided an opportunity to meet with regional U.S. and Canadian legislators. The summit is sponsored by the Pacific Northwest Economic Region (PNWER), an organization to which I have been named a delegate. 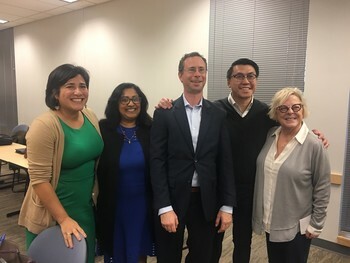 I was appointed to the Thrive Washington board earlier this year, and finally had the opportunity to spend time discussing how the organization will move forward with the newly formed state Department of Children, Youth & Families and serve the state’s youngest residents in early childhood education. Since working with Dr. Martin Deutsch, whose research led to the formation of Head Start, I’ve been passionate about making sure these formative years provide rich experiences to start children off well. I am delighted to be working with Thrive and hope I can make a real contribution. When the Council of State Governments met in Tacoma this year, I again had the opportunity to network with legislators from other states and share solutions to common issues. I also had the chance to hear physician and astronaut Dr. Mae Jemison (pictured) speak. The conference also included a deep dive into NAFTA that was extremely valuable. With Washington relying so heavily on foreign trade, this was a great opportunity to hear from and speak personally with objective economists and representatives from Mexico and Canada. Like many of you, I have been watching the terrible devastation caused by Hurricane Harvey in Texas and keeping those in the path of Hurricane Irma in my thoughts. As our region faces the threat of growing wildfires, I know many of you are concerned for all the people who have had their lives upended by natural disasters. If you are thinking about donating to relief efforts, I encourage to you to visit the Secretary of State’s website for tips on how to make sure any charitable contribution gets to the people who truly need it. I will continue to keep you updated on my work — this will be a very busy interim! As always, please don’t hesitate to contact me with any questions or concerns. We’ve flipped the calendar to June and I thought I would share a quick update with you about progress on some of the big issues we are facing in Olympia. Since the regular session ended in April, Democrats and Republicans haven’t been able to reach agreement on a budget that solves the McCleary school funding challenge. Our budget negotiators remain in Olympia, but progress has been slow as Senate Republicans have taken a “my way or the highway” approach. Read more about why it’s so important that we stand up against the GOP budget below. I recently joined state and local officials to celebrate the beach restoration project at Lake Sammamish State Park. Great teamwork will result in a great park! 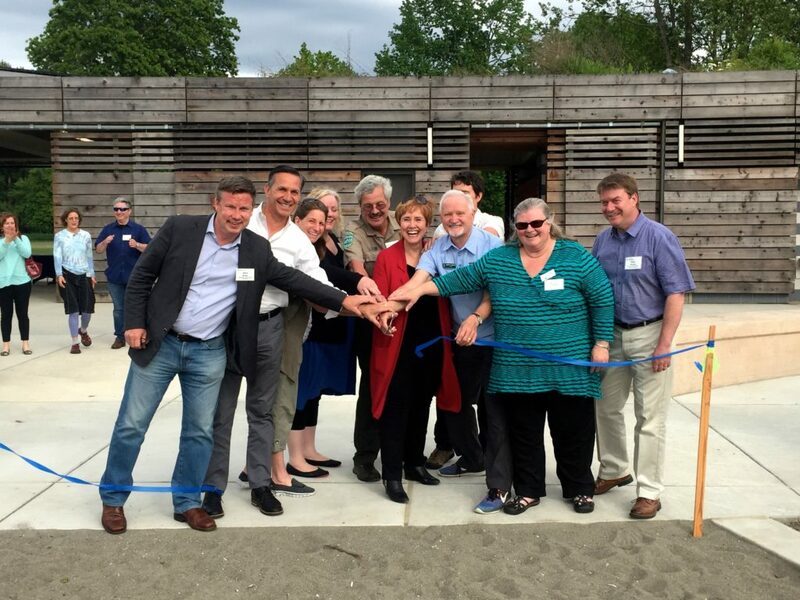 While we wait for a breakthrough on a budget deal, I’ve had the time and opportunity to meet with many of you over the past several weeks — at a ribbon cutting at Lake Sammamish’s new beach, at an inspiring meeting with the Northwest Immigrant Rights Project, at Gov. Inlsee’s Summit on Career Connected Learning. Suffice it to say, it has been jam-packed few weeks connecting with our community. (Check out my Facebook page to see a few photos from these events.) It’s such an honor to serve you! As we proceed through a second special session, a lot of people don’t understand why Democrats and Republicans haven’t been able to reach agreement on a budget. In fact, the problem is twofold. The respective budgets proposed by House Democrats and Senate Republicans take very different approaches to taxation and education funding. It’s important for you to know how their plan would work and how their numbers add up. In comparing the Republican and the Democratic plans, the two key measures are how much your district would receive in education dollars and how much your district would pay in property taxes. For instance, taxpayers in the Bellevue School District will see that the overall net increase in student funding is about the same under both plans: $2,563 (Republican) compared to $2,519 (Democratic). But at the same time, overall property taxes for all Bellevue homeowners under the Republican plan would be $82 million higher than under the Democratic plan. In other words, under the Republicans’ plan, Bellevue taxpayers would pay $82 million more in property taxes overall and receive about the same per student in education funding compared to the Democrats’ plan. The results will vary from district to district – explore the map above to see the true cost and benefit of each plan at full implementation. Sen. John McCoy argues the Senate Republican budget mirrors what Trump is doing in D.C.
Sen. Kevin Ranker offers a snapshot of current negotiations. Sen. Sam Hunt explains why we can’t turn our back on state workers this year. I’d also encourage you to read a recent column by the Spokesman Review’s Shawn Vestal. It clearly explains the frustration many of us share. 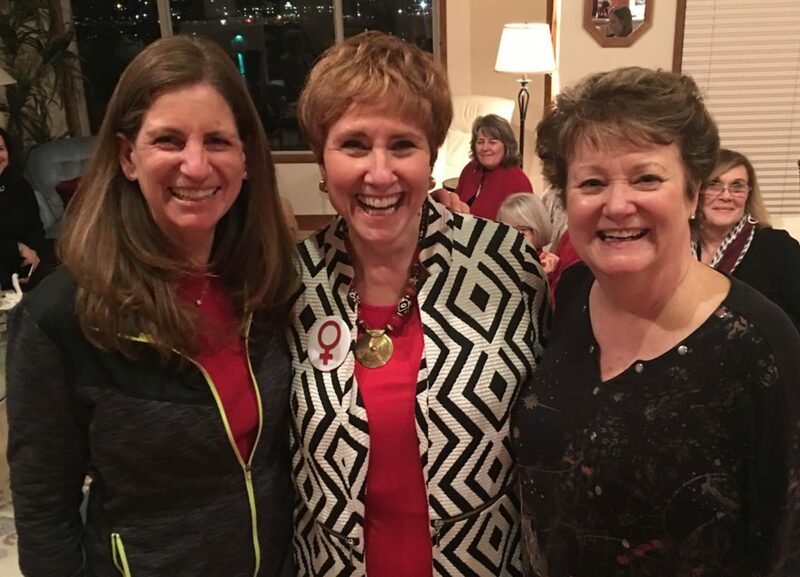 I joined fellow mentors Lisa Quast and Nancy Isley to celebrate the UW Foster School of Business MBA Mentor Program. 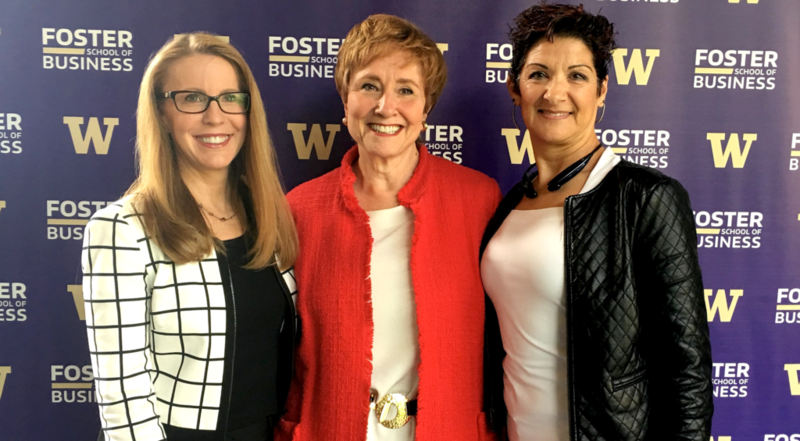 For the last decade, I have had the opportunity to share lessons I have learned from my years as an executive with the next generation of business leaders at the University of Washington’s Foster School of Business. The program connects MBA students with experienced executives to help students navigate their way in the business world. Programs like these at our public universities and colleges are critical to give students a chance to see real-world application of the skills they are learning. 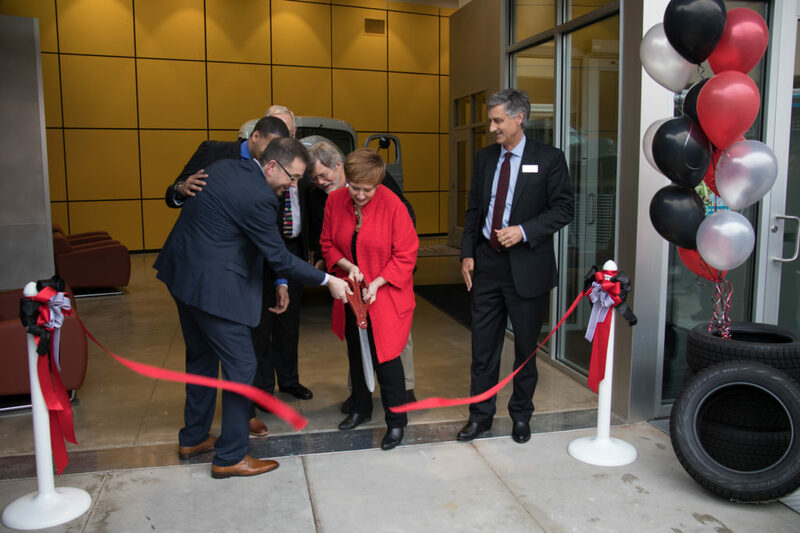 A few weeks ago, I had the pleasure of cutting the ribbon for the grand opening of the new Auto Complex at Renton Technical College. I had a chance to meet with RTC President Kevin McCarthy and learn about how the capital investments we make in Olympia are invaluable to the state’s workforce and economy. The new center will allow the college to expand opportunities for students to train to work as professional auto mechanics and RTC is the only technical college in the state offering specialized training to work on Ford products. Quality professional and technical education is key to our state’s future and this project moves us forward! Please don’t hesitate to contact me about the issues that matter to you. With less than two weeks remaining in the 2017 legislative session, our focus has turned to budget negotiations and how we will direct state spending over the next two years. Senate Republicans and House Democrats have now passed operating budgets that look very different from each other. The Senate has also unanimously passed a bipartisan capital and transportation budget proposals. Every two years, the majority parties in both the House and Senate have a chance to write a budget that will dictate state spending over the next two years. These two proposals provide a basis for negotiations as the session winds down. Although everyone in Olympia agrees that funding education is our top priority this year, Senate Republicans have released a plan that will actually reduce funding in some schools while focusing their attention on an unfair property tax redistribution scheme that penalizes our communities in the Puget Sound region. Their plan also redefines “poverty” which would reduce the number of students who qualify for assistance. On top of it all, their budget slashes funding for programs that serve the most vulnerable in our society. We are also concerned Senate Republicans don’t exactly know what they voted for as recent analysis shows their budget shortchanges education even more than we first thought. The good news is the House Democrats have released a plan that would make key investments in both K-12 and higher education without making drastic cuts to the social safety net. Their budget would provide funding to modernize school facilities, provide reasonable teacher compensation, and hire more guidance counselors and parent engagement coordinators. To pay for their plan, House Democrats propose a new capital gains tax, imposing a 7 percent excise tax on the sale of corporate stocks, bonds and similar gains. Fewer than 2 percent of taxpayers would see an increase. It also restructures the state’s Business & Occupation Tax, shifting the burden from small business owners to the highest grossing businesses. It also closes costly tax breaks and makes progressive reforms to the real estate tax rate. Last week in Olympia I had the pleasure of meeting students from Yakima to Grays Harbor who were finishing up work on tiny houses they have constructed over the past few months. The houses will be used in an encampment for homeless individuals and families. It was so inspiring to speak with the boys and girls at work and hear about how they are learning career and technical skills through their thoughtful analysis of use and design. Building careers for life! Thanks for the great town hall! Thanks to all the people who participated in the 41st District Town Hall. We had a productive discussion about funding education without destroying the social safety net, immigration and the governor’s executive order, homelessness and poverty, traffic and roads among other things. I was so pleased to be able to share my experiences in Olympia as a new senator with constituents and look forward to more personal contacts in district once this session is over. Hearing from the residents of the 41st is really important to me and how I approach the job. As always, don’t hesitate to reach out to me via email, phone or social media including Facebook and Twitter. Thanks for the honor of serving you in Olympia. We used many strategies in recent weeks to try and convince Senate Republicans to pass the levy extension, including this sign. After the bill passed, I was happy to celebrate with one of our Senate staffers, Victor Rubio Rivera, who diligently updated our message for more than 40 days. 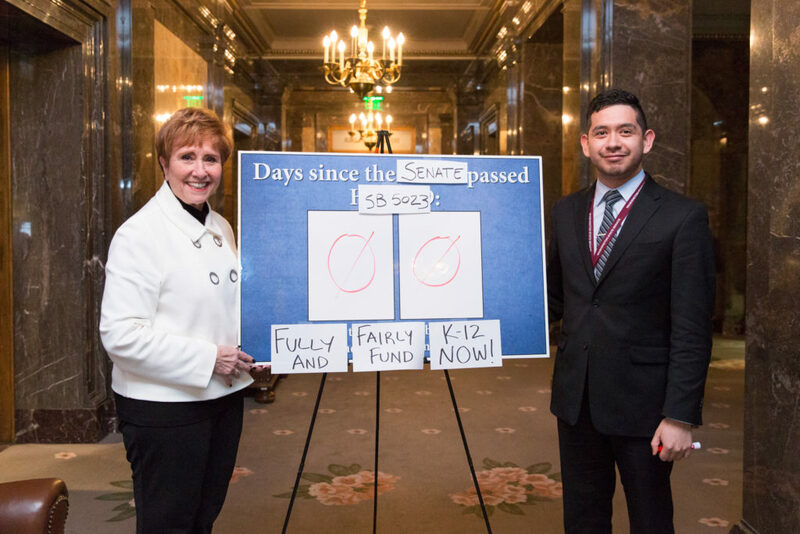 I am thrilled to report that this week the Senate passed my bill (SB 5023) to avert the levy cliff and prevent a massive budget cut to our school districts next year. The bill allows school districts to collect the levies approved by the voters, but Senate Republicans refused to act for 43 days while administrators were put in the impossible situation of deciding who to lay off and what programs to cut. And then on Wednesday night, we finally struck a deal with Senate Republicans to end this needless uncertainty and allow our public school employees to do what they do best — educate our children. My bill was quickly approved by the House on Thursday and I expect the governor to sign it into law early next week. I want to thank all the parents, teachers, students who spoke up and helped move the needle on this important issue. We persisted together and it paid off! Now, we need to tap that same energy as we work to find a solution on the larger education funding challenge. I hope you will be able to join us for the 41st District Town Hall on March 18 at Somerset Elementary School from 10 a.m. to 12:30 p.m. I will join Reps. Tana Senn and Judy Clibborn to provide an update on the 2017 legislative session and answer any other questions or concerns you may have. I look forward to seeing you! We are now more than halfway through the 15-week legislative session and this week marked the “house of origin” cutoff – a deadline for all non-budget bills to move from one chamber to the other. Senate Democrats fought hard to advance progressive ideas that provide real help to people in our state. We will now shift our focus to and debate the 750 bills that are still “alive” and work on finding compromise on a plan for amply funding public schools. We have been so busy with policy and legislative work, we haven’t been able to put any work into decorating our bare office walls. We are hoping you can help! We love all the furry creatures of the 41st District and we thought it would be fun to create a collage of “Dogs of the 41st”. Please send us a picture of your pup and we’ll add them to our collage. Thanks for the help, Sophia and Paige! I had the pleasure of hosting two exceptional students from Mercer Island High School last week. 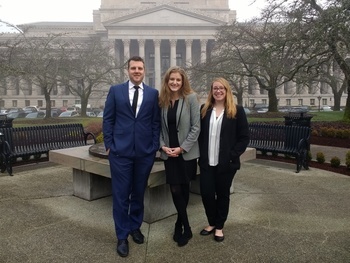 Sophia Kershaw and Paige Fisher served as pages for a week here in Olympia, helping out and learning about the legislative process. If you want to learn more about the page program, click here. It’s been a busy few weeks as we close in on the mid-point of the 105-day legislative session here in Olympia. We are starting pass bills out of the Senate, including my first bill to safeguard the privacy of college sexual assault victims by protecting their conversations with campus advocates from public disclosure laws. Victims who seek help on campus should know their personal histories will be confidential. I’ll continue to work with students from all the major state universities and colleges as this bill moves to the House for consideration. It’s been a month since the House passed a bill to allow school districts to continue collecting local levy dollars at the current rate. Without action from the Legislature, our school districts will have to prepare for what’s called the “levy cliff” — and lose millions of dollars in funding. Senate Republicans are refusing to address the crisis, creating chaos and uncertainty for schools. In just a few weeks, districts will have to start sending out layoff notices. This is completely unacceptable and Democrats will continue to urge action to prevent this unnecessary disruption to classrooms across the state. Gov. 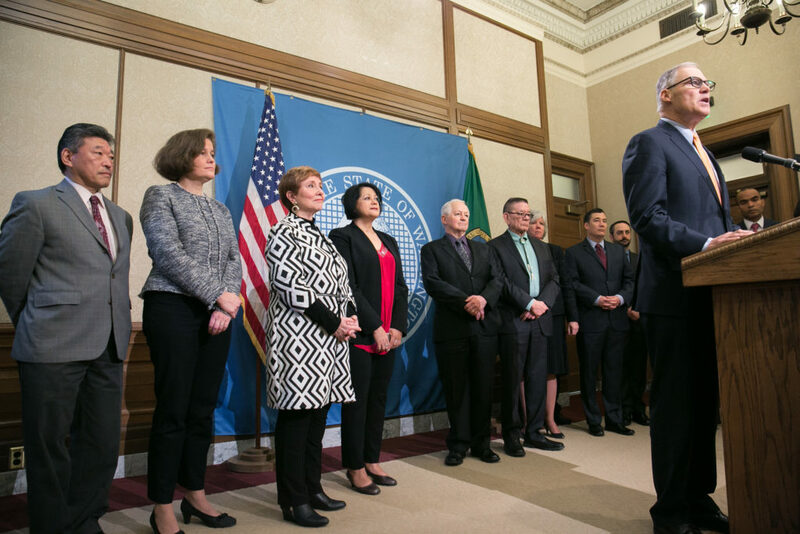 Jay Inslee signs an executive order affirming and clarifying Washington state’s policies for state agencies who provide services to immigrant Washingtonians. Like many of you, I remain extremely concerned about the policy and rhetoric coming from the Trump administration. I was proud to stand in support of Gov. Inslee on Thursday as he signed an executive order reaffirming our state’s commitment to tolerance. I’m especially proud of the governor’s action this week because his staff used language from my bill: SB5689 – Keep Washington Working Act. My bill is aimed at protecting the state’s economy by prohibiting hostile work environments for the thousand of immigrants who contribute to our economy. Immigrant advocates, religious leaders, business owners and educators all testified in support of my bill, but Senate Republicans refused to bring it up for a vote. Thankfully, the governor came through with “Plan B” – and signed the executive order. Watch the event here. Democrats and Republicans in Olympia have approved their respective education proposals. It’s now time to sit down and start negotiating. Our budget negotiators this week formally requested meetings with Senate Republicans so we can improve education outcomes for our 1.1 million K-12 students. I have serious concerns with the Republican plan, as do many educators in our school districts. The Republican proposal looks more like a property tax redistribution scheme than an education plan. I will not support a final package that undermines our quality teachers, redefines poverty, and shortchanges our kids. 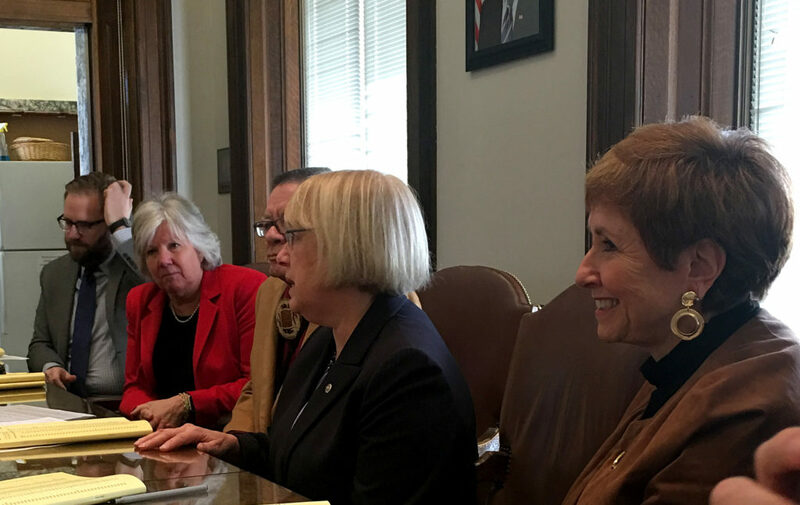 Sen. Patty Murray visited Senate Democrats this week to give us an update on what she’s doing to hold the Trump Administration accountable. She told us how inspired she is by the thousands of Washingtonians speaking up for our values and shared that she received 55,000 letters opposing the confirmation of Betsy DeVos as secretary of education. I’m so proud of our state and the grassroots energy we are creating together. Sen. Lisa Wellman and Page Abraham Schenck. It was pleasure to host Abraham (Brahm for short)Schenck this week as a Senate page. 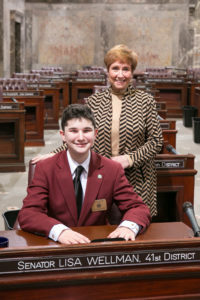 Brahm, 14, spent the week helping out our office and learning about civics first-hand in Olympia. I hope he returns to Seattle Academy of Arts and Sciences with a lot of knowledge to share with his classmates. If you know someone who is interested in page program, more information is available here. We are finishing up the third week of the 2017 legislative session here in Olympia and I wanted to take a moment to provide a brief update. I have been busy settling into my new office and taking on my roles on two committees – the Energy, Environment & Telecommunications Committee and the Agriculture, Water & Rural Economic Development Committee. I was also honored to be elected by my colleagues to serve as vice caucus chair this session. In that role, I will help foster the vision and values of Senate Democrats as we navigate the 105-day session. I was sworn in during Opening Ceremonies in the Washington State Senate on Jan. 9. The most pressing concern for our public schools is a $356 million shortfall facing the districts across the state next school year. The shortfall is created by the so-called “levy cliff,” which is an artificial limitation in state law on local districts’ ability to collect money that has been approved by district voters. Mercer Island will lose about $1.8 million next year if the Legislature doesn’t act. My bill (SB 5023) has yet to receive a hearing in the Senate, but the good news is the House of Representative passed the companion bill with a bipartisan vote of 62-35. Now we are waiting on Senate Republicans to act quickly on passing this legislation so schools around the state aren’t forced to cut programs, lay off teachers and increase class size. We should not be playing politics with school districts, superintendents, parents and teachers and, most importantly our (and their) children. While Democrats released a plan to address education funding before the session started, Senate Republicans finally offered a bill over the weekend. Now we can start finding compromise and deliver a solution that will reduce class sizes, increase teacher salaries, and give us the ability to build or renovate schools. We are still digging into the details of the Republican bill, but we are very concerned that their proposal picks winners and losers. Many school districts in the Puget Sound region — including Mercer Island — would pay more in taxes and receive fewer educational services. I’ll share more details on both plans in the coming days. Thank you for the privilege of representing you here in Olympia. Please reach out to me via email, phone and en-gage on social media including Facebook and Twitter. I am here to listen and be your voice in Olympia.